The White 6-Ball Waterfall Faceout for Wire Grid will let you maximize your wire grid panels and free standing displays. Faceouts allow you to face your merchandise forward in a linear clean way quickly and efficiently. The 6 ball waterfall permits you to face your merchandise forward in a way that pleases the eye by graduating the merchandise on an upward slope. Additional features include a 1” square tube with a unique “ball” design integrated onto the fixture for uniform spacing. 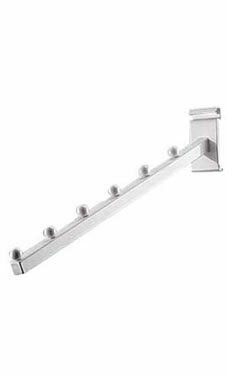 This is the perfect fixture for displaying handbags, accessories and clothing.